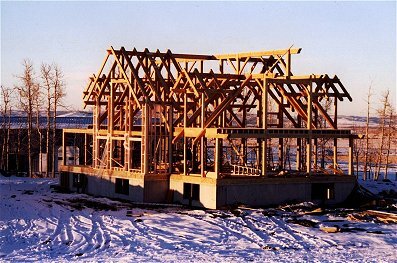 For almost 26 years now, we have been creating beautiful and unique timber frames. Our past projects have included private residences, commercial buildings, Polo Stables, a Church and even a Best Western Hotel. We have a lot of fun doing what we do. If you do happen to see the 'Crazy Creek' - let us know. 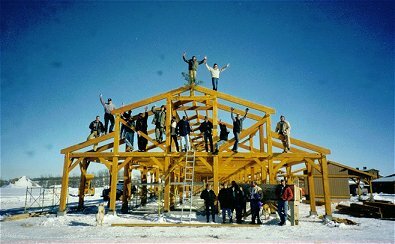 Crazy Creek Timber Frame Structures Ltd. is located just outside of charming Okotoks, Alberta. Our view of the Rocky Mountain panorama from our shop is awesome. Okotoks is just 15 minutes south of Calgary. Our timber frames have been shipped throughout Canada, the US Pacific Northwest, Montana, and even Japan. Shipping is easy, most of our frames fit on a conventional semi tractor trailer deck. We typically use Reclaimed (timbers cut from standing dead logs) Native Canadian Douglas Fir for our timber frames. These timbers are dry and stable with tight old growth ring structure. We think it is important that no live trees are cut to obtain these timbers. Timber frame floor plans are amazingly flexible. The timber frame itself supports the entire home. If you have a one-of-a-kind view, you can make an entire wall open with windows from floor to ceiling. As the needs of your family change, the interior walls defining your living spaces can be moved or eliminated altogether. The typical 3 bedroom floor plan of your home can easily evolve into the newest trend of an open, multi-use 'loft style' living space with soaring vaulted ceilings. The oldest home in North America (built in the 17th Century) is timber frame. There are thousands of Timber Frame structures in Europe that are still in use after 500 years. Our joinery is authentic mortise and tenon secured by hickory pegs. 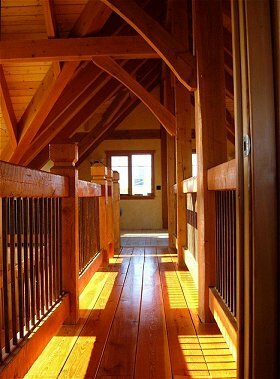 Timber framing uses historical joinery methods and geometry principles originating in the Middle Ages. The design and engineering of your home is included. 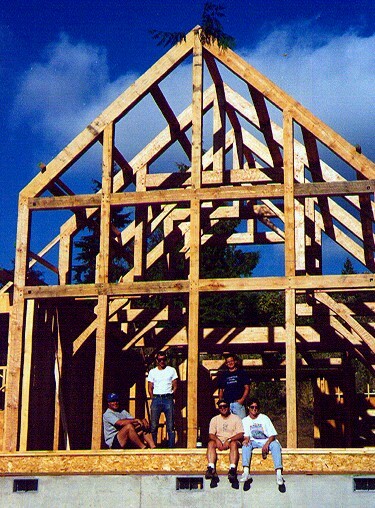 We will help you step by step through the process of designing and building your timber frame. Leave everything to us. 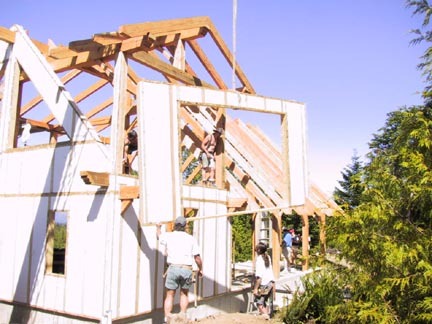 The design and engineering timeframe of your timber frame will vary depending on the complexity of the frame. 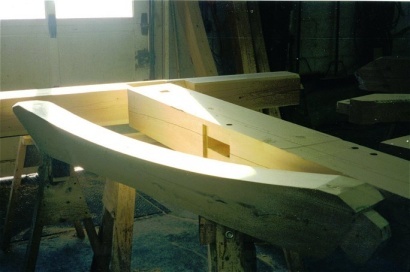 After you have decided on your frame design, the next step will be for us to order your timber. This process will take about 6 weeks. We begin fabricating and test-fitting your frame immediately which will coincide with the ground and foundation placement on your site. We love this part (and so will you). We can install your timber frame or you can do it yourself. Each frame is fully test-assembled and reference marked for ease of placement. It goes together like a puzzle. The raising of the frame is a traditional, time honored event. The whole family can take part in actually raising the family home. In our modern world, such 'hands-on' opportunities are lost to the archives of Canadian history. Either way, the experience of building and raising your own timber frame home will end up being one of your great family memories. 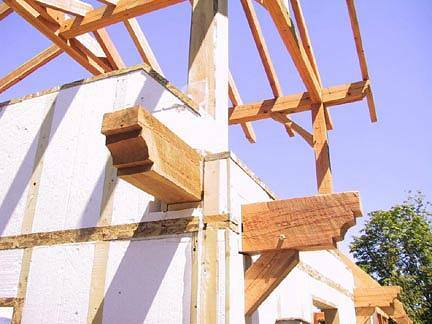 Our system is unique in that it is a cross between stress skin panels and typical stud framed construction. We have developed this system specifically for our timber frames. Our TimberWall panels incorporate a EPS foam core inlaid with conventional dimensional lumber. A cavity in the walls allows for wiring to be done in normal fashion. Our CADD timber frame data is superimposed to the panel manufacturing process. Panel style enclosure systems are a good idea and they're here to stay. With a panel type enclosure system, the timber frame is enclosed very quickly, reducing potential weather damage to the timber frame. Studies have shown that the 'envelope effect' of enclosure panels provides superior insulating properties to those of typical 'batt' type insulation. The R-value of our EPS insulation system is R-20 for the walls and the roof is equivalent to R-40 fiberglass insulation.